Designed to offer riders the most advanced, protective and performance enhancing helmet possible with excellent ventilation, comfort and a light weight, the S-M8 draws on Alpinestars depth of experience in world class innovation across all motorsports and its deep rooted commitment to motocross. The S-M8 shell utilizes a highly advanced molding technology with a multi-composite combination for the greatest levels of protection while the smooth outer layer is streamlined and free of any external channels and features that might act as a load point in an impact, or compromise the overall integrity of the construction. Other key design touches include the patented A-head fitting height and angle adjustment system, the patented visor release system, MIPS, emergency release system and a hydration system compatible lining design for easy and quick fitting and connection to a hydration system. Shell construction utilises a highly advanced molding technology with a multi-composite combination: uni-directional carbon composite with aramid layer that gives significant radial strength around the shell, preventing compression but allowing controlled deflection for reducing transmitted impact energy, and providing critical penetration protection. The Supertech M8 shell construction is optimised to offer best fit across the range of four size options. Shell sizes are manufactured in small, medium, large and extra-large to ensure that riders have the correct fit which not only improves comfort but, most importantly, the effectiveness of the helmet in an impact. 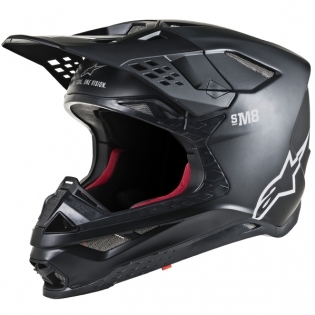 The Supertech M8 incorportes a patented system to allow the helmet to be tuned exactly to the riders preference for the height and angle at which the helmet sits on the head. This unique technology allows for an ultra-specific set-up that can be adapted for the type of riding and the rider’s preference. Alpinestars has developed a unique visor release system which, while ensuring the mounting is held securely in place for riding over the most extreme terrain and any track conditions, provides exactly the right level of resistance to ensure the visor detatches from the helmet shell if it is subjected to a significant impact - no matter what the angle. 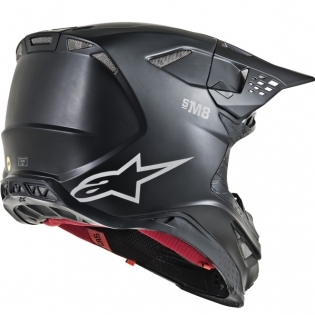 The S-M8 visor release mechanism is conceived to avoid the inherent weaknesses in other types of anchoring systems. 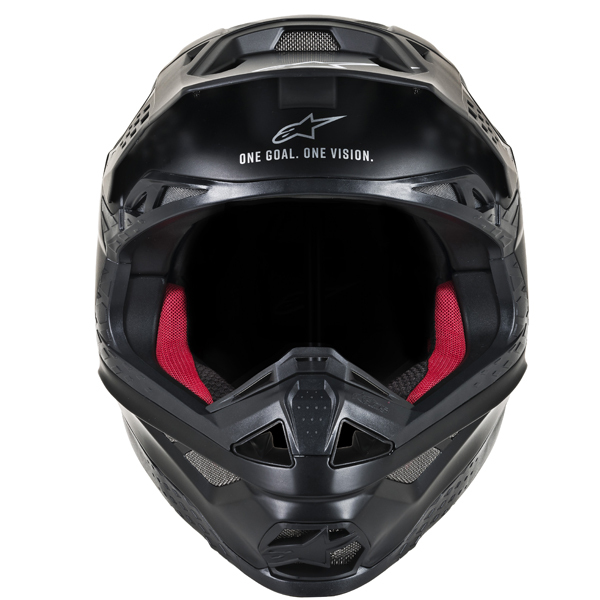 Maintaining shell integrity is vital for safety and with the possibility of multi-directional forces impacting on the visor, separation at the critical point of loading reduces potentially damaging leverage and rotational accelerations that refer injury to the rider’s neck and spine. The base of the S-M8 has been sculpted to give a relief section, where the bottom profile is raised to clear the collarbone (Clavicle). Also, incorporated into the area of the base pad, where it sits over the rider’s collarbone, is an energy absorbtion pad; a more flexible compound rubber section which allows deflection when it contacts the Clavicle. A low friction ‘slip’ layer is incorporated into the Supertech M8 helmet, between the comfort padding layer and the multi-density polymer energy absorption shell. When energy is impacted upon the helmet, causing a rotation force, the MIPS layer allows for movement of the inner absorbtion layer to damp and re-direct the energy before causing significant acceleration stress to the brain. This mitigates the causes of brain injuries, such as concussion. The side cheek padding of the S-M8 can be extracted efficiently and safely, while the helmet is still on the rider’s head, to allow ease of removal by trackside support and medical staff. The Supertech M8 is also designed to allow a helmet ‘Eject’ inflation system to be fitted into the inside crown of the shell. Along with the ERS padding removal, ‘Eject’ allows for emergency removal of the helmet, without putting load on the rider’s spine. Chin-strap: Wider than certification requirement: 26 mm for comfort and produced with a woven poly yarn to give a soft ‘hand’ feel that connects securely with a double D-ring. Heat mapping tests have resulted in specifically designed ducting which produces a positive flow into the helmet over and around the rider’s head, improving comfort while riding and reducing the on-set of heat stress in extreme conditions. 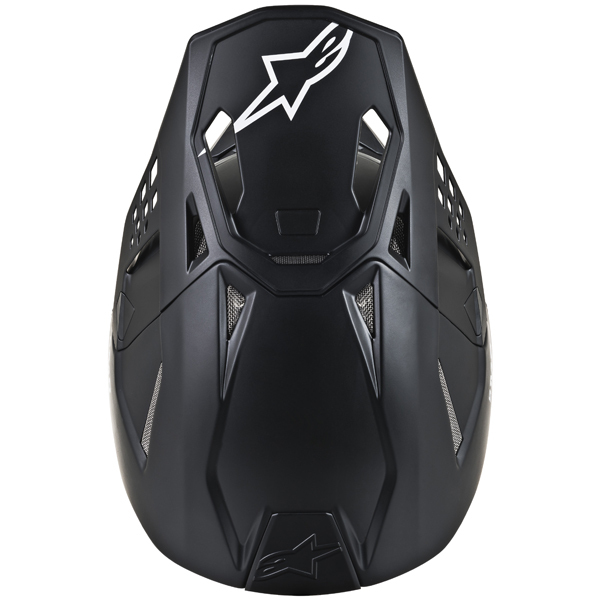 The visor design of the S-M8 is also an integral part of the ventilation system as it is profiled to direct airflow, acting as a channel to concentrate and smooth the flow into the shell. The Supertech M8 liner design is formed to optimize airflow channeling around the rider.